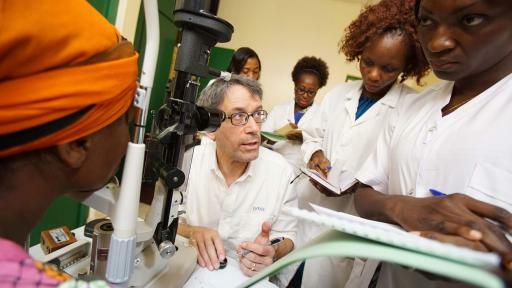 New York, New York (Oct 12, 2017) – Today on World Sight Day, Orbis, a leading non-profit in the prevention and treatment of avoidable blindness, is conducting a four-week training program on the Flying Eye Hospital—in Yaoundé, Cameroon, a country with one of the highest prevalences of blindness and visual impairment in the world. Hosted by the Ministry of Public Health (MoPH), the aircraft arrived in the city last week for a hands-on training that supports Orbis’s ongoing work in the country: strengthening the capacity of clinical and operational eye care professionals at our partner hospitals, Yaoundé Central Hospital (YCH) and Magrabi ICO Cameroon Eye Institute (MICEI), Yaoundé. Help us achieve our vision today. 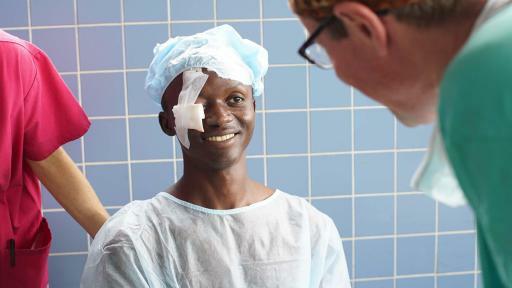 Glaucoma patient Heiman post-surgery in Yaoundé, Cameroon (2016). 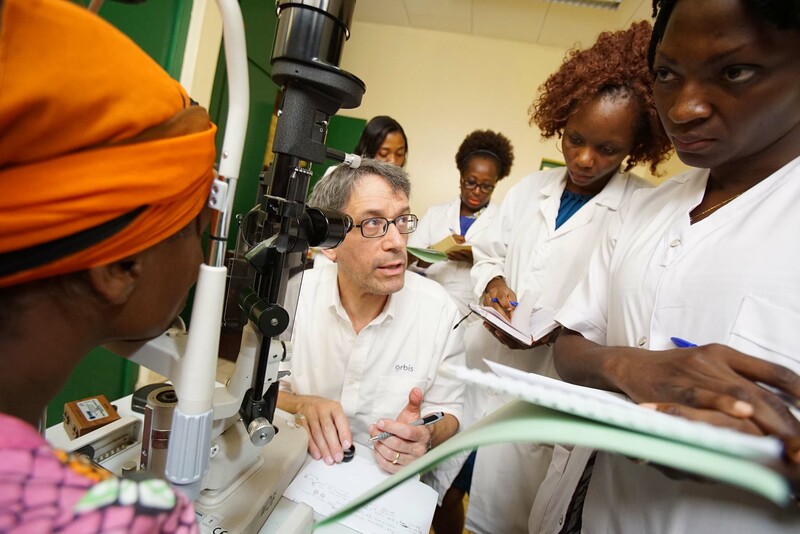 Volunteer Faculty Dr. Mark Lesk trains local doctors on glaucoma screening in Yaoundé, Cameroon (2016). 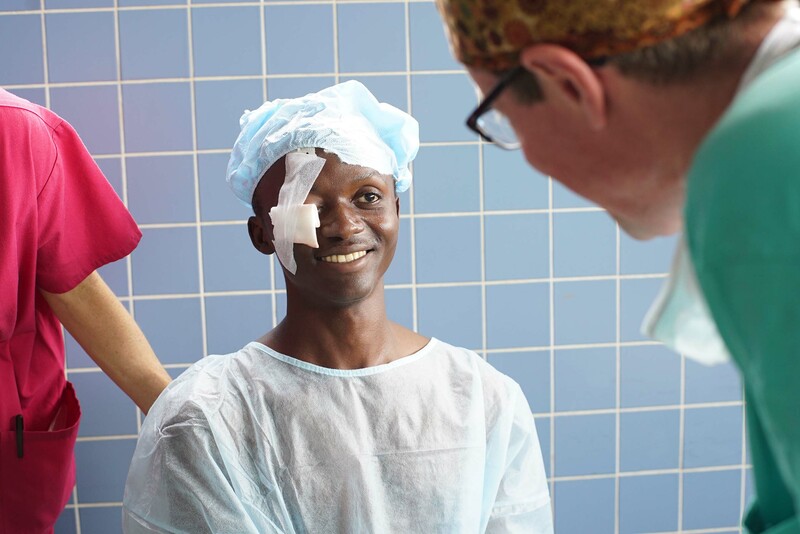 To meet the obstacles faced by local hospitals, the training is being customized to focus on five subspecialties, including cataract, and will include different workshops, covering a range of topics from refraction to equipment repair and maintenance. The project is also a continuing medical education opportunity for local nurses, anesthesiologists, biomedical engineers and technicians through lectures, case discussion, observation, symposia and hands-on training. This skills-transfer work in Cameroon is timely, given the startling global inequalities in visual impairment revealed by the latest data published by the Vision Loss Expert Group (VLEG) in the Lancet Global Health and the International Agency for the Prevention of Blindness (IAPB) in the IAPB Vision Atlas released today. The data shows that across the 253 million people in the world who are blind or moderately to severely visually impaired (MSVI), uncorrected refractive errors (eye conditions that can usually be treated with glasses) and cataract are the main causes.3 This new data comes on the heels of a previous VLEG paper4 published in August, which showed that while 90 million people were treated or prevented from becoming blind or visually impaired between 1990 and 2015, trends in an ageing and growing population subject to increases in myopia and diabetic retinopathy could lead to a threefold increase in blindness by 2050. Visit the IAPB Vision Atlas for the latest global data surrounding vision. 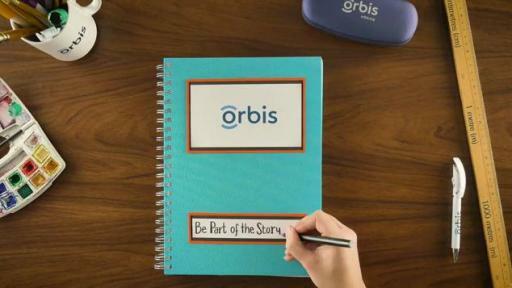 Visit the Orbis Facebook page to view a walk-through of the Flying Eye Hospital in action in Cameroon on World Sight Day. 2 IAPB Vision Atlas, 2017.